Winslow is surrounded by the flat desert plains of the Colorado Plateau, elevation 4,850 feet, just west of the Little Colorado River. The relatively large town center is bordered by the ATSF railway to the south and I-40 to the north, with most hotels and shops concentrated around the three interstate exits; the main location is North Park Plaza at exit 253. The next major towns along I-40 are Flagstaff 58 miles west and Holbrook 33 miles east. Homolovi State Park is the one attraction in town, preserving several ancient sites built by the Hopi people around 1350. 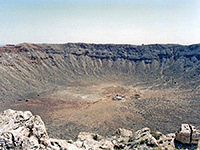 Much more famous though is the Meteor Crater, 25 miles west; a huge impact crater, one of the best preserved of such features anywhere on earth. The Best Western hotel in Winslow is located on the east edge of town, in a desert setting close to the course of the Little Colorado River, and next to interstate 40 (exit 255) - the hotel sits on otherwise undeveloped land about 1/4 mile from the interstate, so provides a quiet night's sleep. Downtown Winslow, centered on old Route 66, is 2 miles to the west. The hotel has 54 suites on 2 floors, an indoor pool, hot tub, fitness center, newsstand and plenty of parking space. There is one restaurant at the interstate exit and many more towards the town center, though free full breakfast is available on site. One of several budget-priced hotels in Winslow with the basic amenities of pool, hot tub and free continental breakfast, the Quality Inn is well-placed for cross-country travelers, being right next to I-40 (exit 253; Park Drive), and also opposite a shopping center with several restaurants & bars. The adobe-style building has interior corridors and 72 guest rooms, all furnished with microwave and refrigerator. Downtown Winslow, around old Route 66, is a mile to the south. The Travelodge in Winslow is a traditional roadside motel, next to the town's central I-40 exit (253; Park Drive), a short walk from a selection of restaurants. Rooms (all containing a coffee maker, microwave and refrigerator) are on two floors, accessed by interior corridors, looking out either towards the interstate or south, across the parking area to an empty lot beyond. The only amenities are laundry, free wi-fi and a small fitness center. Winslow's 47 room Rodeway Inn motel offers the closest lodging to I-40 exit 252, on the west side of town, in a lightly developed neighborhood a little way removed from the railway tracks to the south. There is one restaurant opposite and many more towards the downtown area. The two story motel has a modern layout, with interior corridors and a refrigerator in each guest room; other amenities are free continental breakfast, free internet access, and copy/fax services. Pets are welcome, for a small fee. Econo Lodge Winslow adjoins the westernmost of the city's three I-40 exits (252), along the main road to the downtown area and about a quarter of a mile from the railway depot; the nearest restaurants are a few blocks east. Rooms are on two interior corridor floors, looking out across the enclosing parking lot to the lightly developed surroundings. Newspapers, wi-fi, local calls and hot breakfast are complimentary. The pet friendly motel has an indoor pool, hot tub and fitness center. On the north side of Winslow beside interstate 40, the Motel 6 is part of a typical neighborhood of stores (including Safeway supermarket), gas stations and fast food restaurants, and it provides guests with generally clean rooms at low rates. An indoor hot tub and free coffee are the only amenities. The center of Willcox along old Route 66 is one mile south. The motel occupies an interior corridor building, newer than most properties of this brand.